This Parmesan Baked Asparagus is the easiest and yummiest way to eat the veggie! 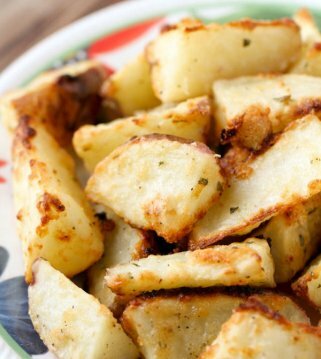 It takes just minutes to prep and is the perfect side dish to any meal! One of my all-time favorite veggies is Asparagus. It has become a family favorite and is one we serve almost weekly as a side dish. 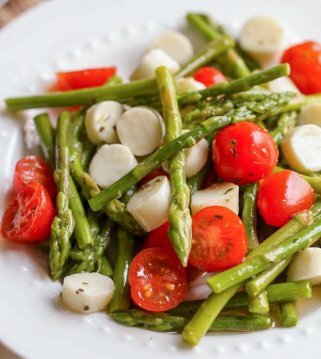 We like to add it into several of our dinner recipes, but we love it as a side; especially love Parmesan Asparagus. This baked asparagus is probably the easiest of them all, but I thought I’d share the recipe with you today if you love Asparagus as much as we do. It’s very simple and always tastes SO delicious! I actually make the same recipe with zucchini, squash and broccoli too because it’s so simple and makes veggies taste even better! There’s not too much to the recipe other than trimming the asparagus, drizzling it with olive oil and then sprinkling salt, pepper and Parmesan cheese on top. Bake for about 15 minutes and you have perfect baked asparagus! 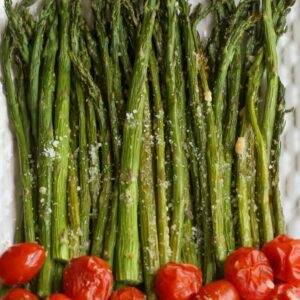 Can parmesan asparagus be grilled? Yes! You can grill them directly in the grate or in foil. Prepare asparagus according to recipe directions. Heat grill on medium heat. Grate Grilling: Lightly oil the grate, place spears crosswise on the grate. Grill for 5-6 min or until tender, but not burnt. Foil Grilling: Lightly oil a large piece of aluminum foil. Place asparagus in center of the foil. Bring foil ends together and seal. Cook for 10-12 minutes. Flipping once during cooking. Can I make baked asparagus ahead of time? You’re not going to save much time by completely making these ahead of time because you’re going to end up heating them back up in the oven. However, you can have them prepped and ready to bake for your meal. Trim ends, sprinkle with oil and seasoning. Keep in them in a container in the refrigerator until you’re ready to bake. Sprinkle with cheese and bake according to directions. How do I reheat baked asparagus? You’re going to want to stay away from the microwave or your vegetable will become mushy. The best way to reheat them is in the oven. 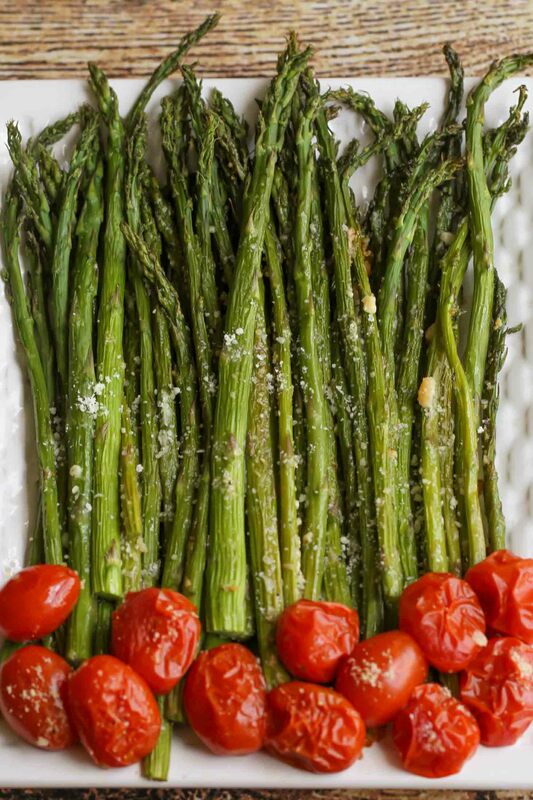 Preheat the oven to 450 degrees F spread asparagus on a baking sheet and cook for 4-5 minutes. 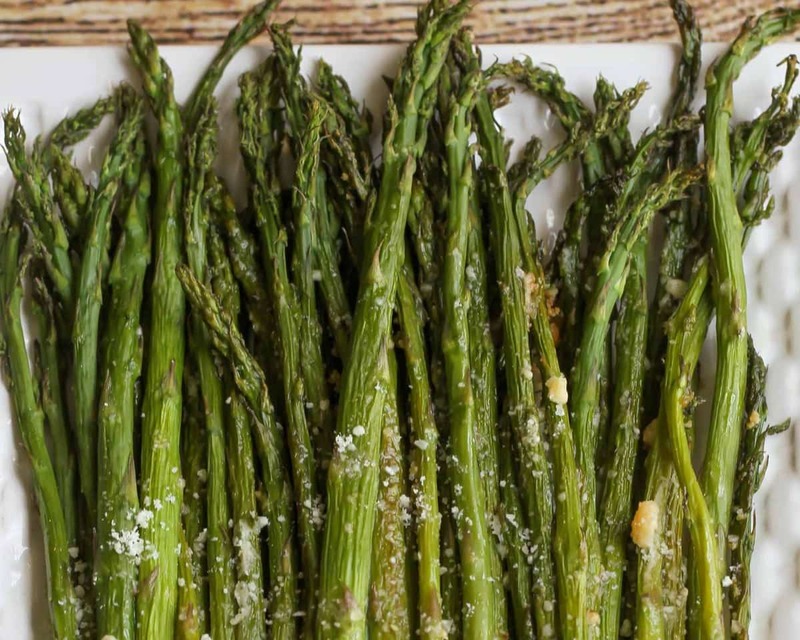 If you’re looking to freeze your asparagus you’ll want to do it before baking. Choose spears that are at least the size of a pencil and larger trim ends and and blanch them. Transfer to a freezer safe airtight container. Asparagus will last for 6-8 months. Like I mentioned before, we do the same thing with zucchini and squash (and lots of other veggies for that matter!) 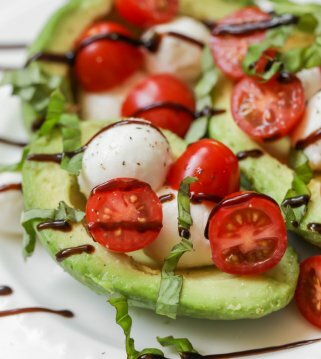 and slice those up and drizzle the olive oil, garlic pepper, kosher salt and parmesan cheese. Works just like a charm! I also wanted to mention that you can bake them however long you like. 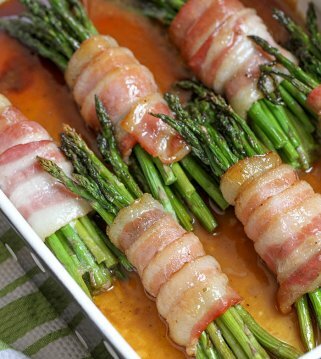 Some prefer the asparagus more chewy or more crispy (how we like them) so just modify the time to how you like. 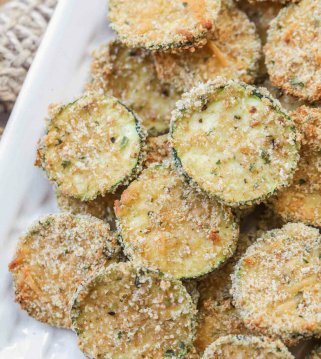 No matter how you bake it the result is a delicious Parmesan crusted veggie that is easy and takes just a few minutes to prep! Trim asparagus ends. 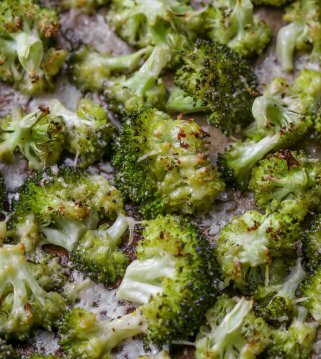 Place on foil lined baking sheet with any other veggies. Drizzle on olive oil. Sprinkle on garlic pepper, kosher salt and parmesan cheese. Bake at 400 for 15-17 minutes. Serve immediately and enjoy. Thank you Kristyn. Have a great week! I love asparagus! Great recipe! Looks tasty. We love asparagus here. Had something similar at the Olive Garden once, (gift card) and it was lovely, but making it at home is at a fraction of the cost. And dining out with kids is zero fun and I only have 3 to your 6. I always end up wearing my dinner. I love how easy & tasty this asparagus is!! It goes so well with so many dishes! I agree!! Thank you for letting me know. So, glad you like them!